Balinese cat breed information and advice. Balinese cats are not the shy and retiring types, they are smart and into everything! Some say that the Balinese is a softer version of the Siamese cat breed with their quieter demeanours and beautiful semi-longhaired coats, but one thing that many breeders will agree on is the gracefulness of this lively breed as they seem to glide as they move. Liz Corps, chairman of the Balinese Cat Society, adores these beauties. She says: "They are one of the most beautiful cats never to have made it into a top 10 breeds list!" As with their Siamese relatives, the Balinese are known for their lively, intelligent personalities and are into everything you do. Liz says they are very dog-like in their characteristics, adding: "They can be just as scatty as the Siamese, but also just as clever. But there's no malice about them at all; they are lovely, affectionate cats. I have one that gets herself shut in the larder, but she doesn't let me know she's in there and I'll go to bed, then wake up in the morning and find that she's caused chaos! I've come downstairs before and found that everything has been covered in jam!" 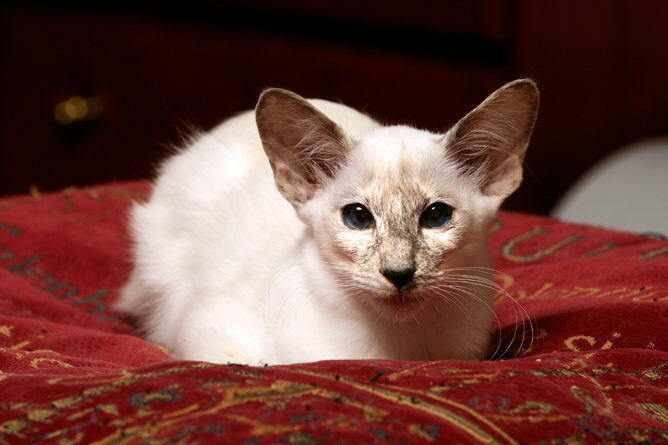 Sue Pinington of the Balinese and Siamese Cat Club concurs, and says that one of her Balinese had a penchant for sitting on top of the kettle! Why? "Why does any Balinese do any of the things that it does?!" she laughs. So while you may have your hands full trying to keep tabs on this magnificent mischief maker, you won't fail to be charmed by their innocent faces and graceful, dancer-like moves. Balinese can be found in all the same colours as the Siamese. They have the same blue eye colour as the Siamese and have the same temperament - in fact, the only difference between the two breeds is the coat. While the Siamese has a short, sleek coat, the Balinese coat is fine, silky and up to two inches in length, with a beautiful plumed tail which is often held straight up in the air. Sue says: "Someone once said that you don't know it's a Balinese until they stand up and you can see their tail as they look so much like Siamese!" They have also inherited the stunning large ears and lithe, graceful bodies from their Siamese relatives. Considering their stunning semilonghaired coats, Balinese need little or no grooming, although Liz says they are happy to be groomed if the fancy takes you: "They have a very elegant coat but they don't really need to be groomed as they don't have an undercoat." Although you must make sure you give their large ears a clean from time to time. Liz adds that Balinese are generally a healthy breed with no known inherited diseases to speak of, apart from those known to crop up in the Siamese. The original Balinese dates back to the 1930s in the USA where longhaired kittens were cropping up in litters of Siamese. Their longhaired gene was thought to have been introduced when newer colours were created in Siamese by outcrossing to Persians. A few US breeders including Marian Dorsey of California, Helen Smith of New York and Sylvia Holland, an Englishwoman living in California, decided to establish these longhaired Siamese kittens as a distinct breed. Helen chose the name 'Balinese' for these graceful cats when she commented that they reminded her of exotic Balinese dancers. In 1961 they were given championship status by the Cat Fanciers' Federation. The first Balinese arrived in the UK in 1973 and obtained GCCF championship status in 1986. Breeders charge around £425 for a pet quality Balinese kitten. As they are still quite a rare breed, you may have to wait patiently on a breeder's waiting list - especially if you are after a specific colour. Balinese kittens are born completely white and their colours develop over their first few weeks. When going to see your potential kitten, you should always ask to see the mother and siblings, and possibly the father too if the breeder owns him. Healthy kittens should always be lively and inquisitive, with clean eyes and ears. You may also come across shorthaired Balinese, known as variants, which occur when Balinese and Siamese are bred together. These cats are invaluable in the breeding programme as they carry the recessive longhair gene, which is passed on when mated back to a semi-longhaired Balinese. Variants come in all the same colours as their semi-longhaired counterparts and have short, plush coats, but at present may not be shown.